Social media is an unmissable way to connect customers and firms. It has also become a privileged channel to raise complaints and engage in positive and negative word-of-mouth. In today’s article we propose to analyse one aspect of electronic word-of-mouth (eWOM) which has been recently dealt with in a marketing research published in the Journal of Interactive Marketing by Jie Sheng (University of Bristol). This study investigated whether the firm–customer interaction is also a motivational driver for customer engagement in eWOM. In other words does online managerial response to customer reviews triggers the willingness of community members to post online reviews? Everyone knows that customers’ reviews are especially important in the hospitality context (which is sometimes perceived as a customer dictatorship by firms’ owners). In this research the reviews and responses of 1024 hotels have been analysed over a period of 15 years. Needless to say the results are worth reading for anyone active in the hospitality industry. For those who aren’t aware of the importance of online reviews for hotels, let’s start with this some interesting stats. The sample studied covers a 15-year period and it’s clear from the graph below that it’s been an upward trend since 2009-2010. Interestingly the hotel response rate follows a similar path. The more reviews, the higher the response rate. This was a quite surprizing stat for me. I was expecting the response rate to reach a plateau and not to keep increasing. After all it means that hotel are putting more and more time into the response work which is counterintuitive to me as it may represent additional labour costs in an industry with already tight margins. Unless the responses are always the same (sometimes that I’ve observed many times) and processed “in batch” (copy/paste). Previous research has shown positive correlation between the volume of online reviews and the number of answers of firms to these reviews. Examples of such studies are Proserpio and Zervas (2017), Chevalier, Dover and Mayzlin (2018), Xie et al. (2016). 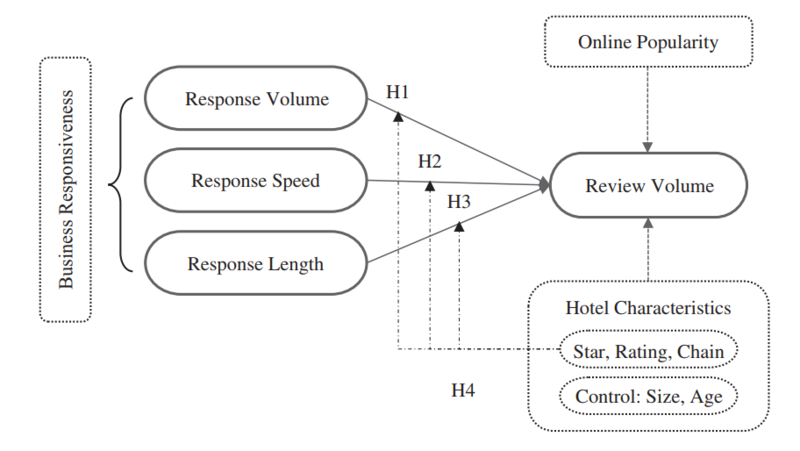 There seem therefore to be empirical evidence that it’s worth the effort for hotels to reply to online customer reviews as it is likely to lead to more reviews and especially more positive ones (Proserpio and Zervas, 2017). Yet, the determinants of managerial response (volume, speed, length) require further research and in particular their impact on customers’ responses ought to be established. Volume is indicative of the willingness of a firm to respond to its customers and may motivate other customers to voice, knowing that what they’ll say will be read and responded to by the firm. The speed factor is well documented to have a positive impact on customer satisfaction in a complaint handling setting. The author argue that higher response speed increases the odds of seeing the response when the volume of online reviews increases and pushes older messages down. The length of the response is indicative of the amount of information contained. Customers may react to authentic or exaggerated information provided, hence leading to an increase of response volume on the customer side. First of all statistically representative differences are observed between responding and non-responding hotels (0.452 and 0.065 online review per day respectively). In other words, hotels which do respond to online reviews seem to get more online reviews. Now let’s go into more details and analyze the effects of the volume, speed and length factors. Volume of response does have a positive effect on the volume on online reviews. More precisely a 10% increase in the answer volume results in a 0.92% increase of online comments in the next period. Hotel rating seems to have no moderating effect. This conclusion therefore holds whatever the number of stars. Response length seemed at first sight to be positively correlated with online reviews volume but once the pre-2009 data is removed from the dataset (the phenomenon of online reviews really takes off around 2009), response length becomes not significant. A wealth of data is collected for this study to answer the important question of how managerial practices influence customer behavior. Interestingly we see that online reviews really starts increasing in 2009 and that managerial response rate keeps increasing despite the increasing volume of online reviews and despite the increasing amount of work it represents. While 2 factors (volume of response and speed) were positively correlated to the volume of online reviews, I want to put the numbers back into perspective. The volume factor has the biggest effect. Yet a 10% answer increase results in only 0.92% increase of the online reviews. For a hotel with a low response rate this may easy to achieve ; for one with an already high response rate it may well be a challenge. Considering the average 60.16% response rate in 2015, I even wonder whether it makes economic sense to ask for more. My impression is that more work will result in diminishing effects on average and unlikely economies of scale.